On July 11 I flew to Colorado to spend a few days visiting a friend who lives in Denver. While not strictly a railfan trip, I did manage to spend a day scouting out the eastern side of the Moffat Route. To my surprise I even managed to shoot a few trains. 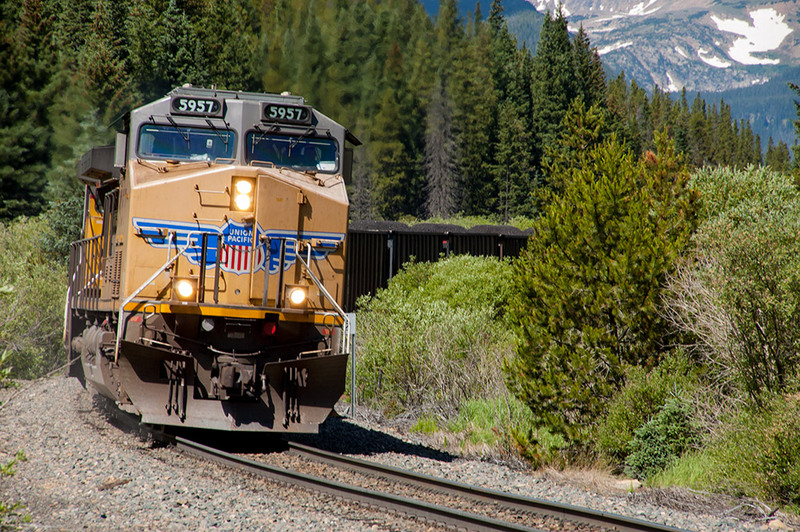 The first movement I caught was an eastbound headed downgrade crossing South Boulder Creek. The tracks are very close to E Portal/Tolland Rd. at this point. I had jumped out of the car to get a quick shot of the bridge and we’d started to drive again when I spotted a headlight in the distance. I scooted back to the bridge and managed to get a couple of semi-decent shots. 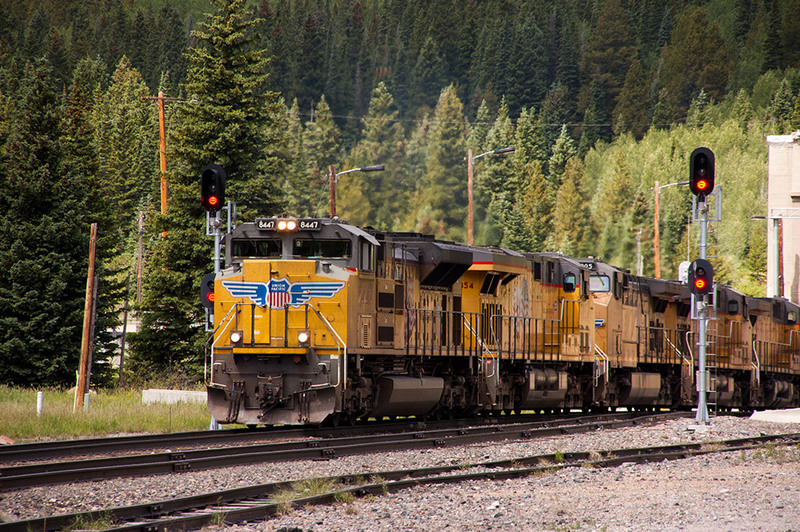 Union Pacific GE AC4400CW is the trailing unit on this eastbound loaded coal train, shown here crossing South Boulder Creek. After the first catch we continued up to the parking area at the east portal. 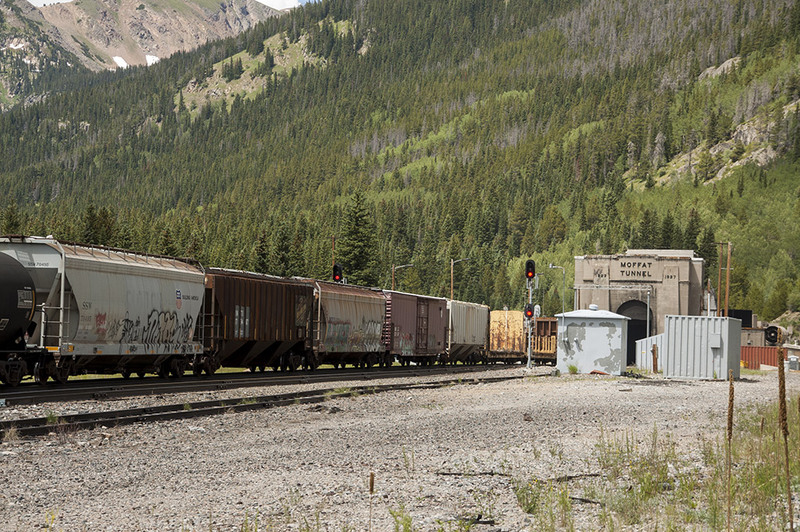 The plan was to go for a hike and not necessarily wait for any more trains, but right as I was getting out of the car I heard a low roar emanating from the tunnel and a few minutes later train number two crawled out. Union Pacific EMD 8447 and four siblings split the signals at east portal heading downgrade with a mixed manifest. It’s not terribly easy to get an unobstructed shot of the portal without crossing the tracks (and trespassing), but I did my best with what I had to work with. There were some interesting and well worn cars on the train I caught exiting the tunnel. Here the famous portal is visible, if slightly obscured by signal boxes and other railroad outbuildings. I had wanted to try to get a shot of a train on Big Ten curve as well, but it appeared to be mostly inaccessible. So for this trip I had to be content with what I could photograph from Rt. 72. I don’t have a telephoto lens, but I did manage to catch one train very slowly grinding it’s way upgrade. 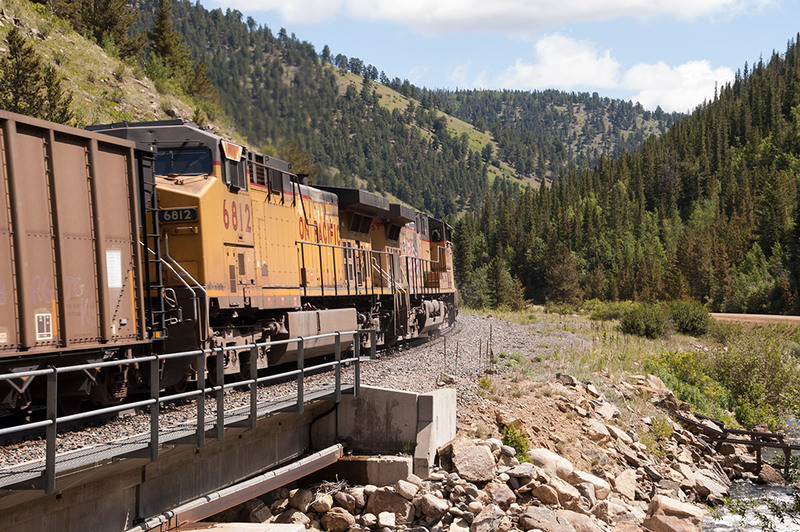 A BNSF Dash 9 leads a CSX Dash 9 and a former SOO SD60 up the grade leading to Big Ten curve. There were more trains than I expected on this route (on a Sunday no less), now that I’ve scouted it out I’m looking forward to getting back to the area to spend some more time trackside. The vista’s are beautiful and as that last shot shows, there’s a lot of variety. 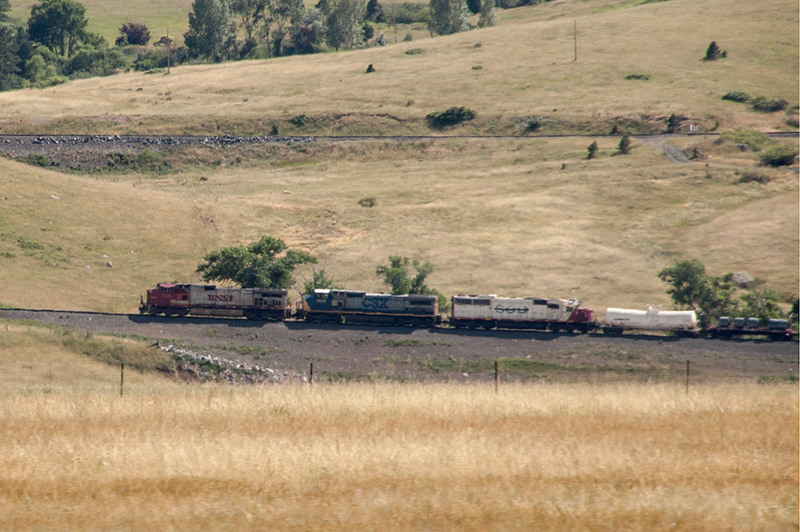 This entry was posted in Railfanning and tagged Colorado, Moffat Route, Railfanning, UP by Milepost15. Bookmark the permalink.